I’ve noticed a lot of you compare yourselves to others and get frustrated when you don’t have success in X amount of time. You want some kind of guarantee or estimate of how much you can make or how long it will take. Or maybe you have analysis paralysis and are afraid to start uploading because you believe you have to get everything right first. If you can relate to any of those statements, you’ve GOT to listen to this podcast. 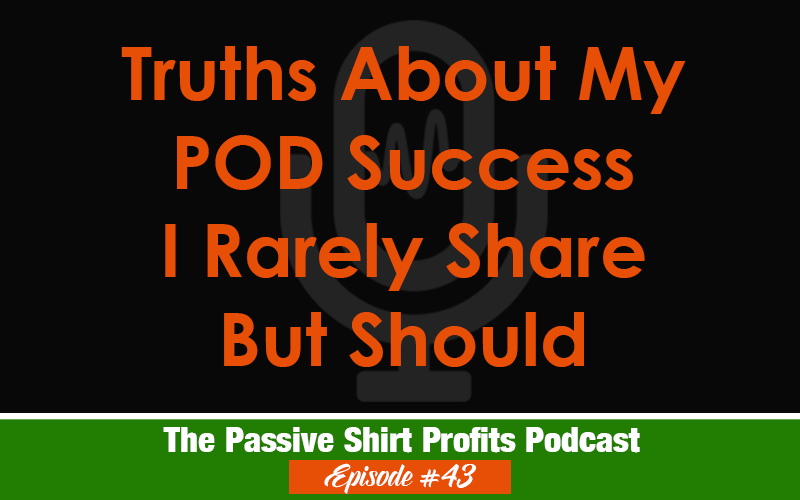 You’re forgetting something very important about what it takes to succeed with POD. It’s something everyone has to go through, and you need to get comfortable with it before you find success. You’re the reason I got into Amazon merch. I was just looking for passive income. I sell about a thousand shirts a year. I don’t make a lot, but I have leveraged being on Amazon and servicing clients in other areas. I make it a side hustle..but I am determined to make it a FULL TIME JOB because of you as well. I’m coming up on month 2 with Merch and was beginning to feel the frustration from not being where I thought I should be. It’s true, we as a society want everything now. But as I step back and look at how much I’ve learned and profited in less than 2 months ($120 woo! ), I realize that progress is definitely being made. It’s funny how perspective is everything. I would never claim to know the official Merch success stats, but I would guess that your success rate is higher than average. Earning $120 in less than two months is probably above average, and even better if you are new to POD. Given the added competition added every month, those results are NOTHING to sneeze at AT ALL! I remember in 2016 when Merch was more wide open, there were people complaining they couldn’t sell anything after a much longer time period. So you must be doing something right. Good for you! Now continue to look for ways to exploit and expand on those ideas that are already selling. This is a BIG part of what I do…. especially now. Exactly Rob! Like I mentioned in the podcast, I had sooooooo many failed sites prior to 2 Create a Website. But I learned what to do by doing so many things wrong BEFORE that site. I didn’t have a mentor, course, or roadmap when I built that site. I found it so fascinating that I get the exact same kinds of questions from people no matter the site. And it’s OK to seek out guidance and general advice to prevent yourself from making SOME mistakes. But you will never know exactly what works for you if you don’t start doing something and making a few mistakes. Heck, I don’t even really think of them as mistakes. I just used that word for emphasis in the podcast. It’s really just experience that we all must gain so we can learn. Like you said, that goes for business AND also life! It is so inspirational to read this – seeing how far you’ve come. Gurrll, I remember that site you had call “Flat Stomach Exercises”. It had some great content, but the site was ugly. We used to tease you about that and you would say, “It might be ugly but it pays my mortgage!” SNAP!!! Lizzie! I knew we’ve been acquainted for some time (it’s always helpful when people use the same avatar as it helps me recognize them. lol) But I had NO IDEA you went back that far to the SBI! days! Man! How times fly and how times have changed. I heard they re-branded. I wonder how that’s all working out for them. I really do miss the community side of blogging and online connections from those days. I often wonder what some of those people I connected with are doing now. Many left after the Google Glory days. Good times indeed. I didn’t even realize it changed from the face avatar. You must’ve just changed it. Now I realize my previous comment made absolutely no sense. lol That’s OK, I bet I’ll still remember it’s you just from this exchange now. 🙂 Cheers! An important lesson here. I know I’m super hard on myself, being an artist I’m always looking at others who have been producing stuff for years. ‘Analysis paralysis’ is definitely something’ I suffer from too. Well put. I’m going to continue to produce content and try and be less hard on myself. Thanks! Awesome, Simon! Thanks for listening. I have been on this planet long enough to know that “slow and steady wins the race” and that “the best education in the world comes from failure”. In a sense, failure is a good thing – it’s the best exercise for your brain (if that makes sense). Before starting out on a new journey, be sure you have enough funds set aside so that you’re not constantly worrying about where the next dollar is coming from – because there is no such thing as “instant success”. Exactly Lizzie!! Failure has been one of my biggest reasons for success online. It sounds crazy but it’s how I learned what not to do. Most people give up too quickly so they don’t get the chance to learn the right way.